Potable Water Treatment – Potable water is water that is fit for human consumption i.e. drinking water. 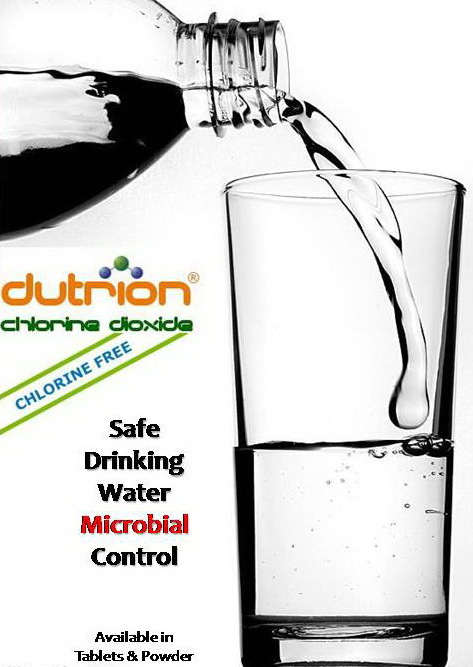 With minimal contact time chlorine dioxide is highly effective against many pathogenic organisms including Escherichia coli (e coli) and other coliforms, Listeria, Staphylococcus aureus, Giardia cysts, algae, Salmonella, bacterial spores, Legionella, Tuberculosis, MRSA, VRE, amoebal cysts, and Cryptosporidium. Chlorine dioxide has also consistently been shown to be the best molecule for eradicating the causative organism of Legionnaires’ disease. It also effectively removes hard water components i.e. iron and manganese, it promotes flocculation, and aids in the removal of turbidity. Chlorine dioxide does not combine with organics to form suspected carcinogens such as THM’s or haloacetic acids (HAA’s). It also provides a lasting residual throughout the distribution system to reduce or eliminate the subsequent growth of bacteria, viruses, and algae. Chlorine dioxide is excellent for use in the treatment of industrial waters and community purification plants. It is also ideal for smaller water supplies such as cisterns and hospital water systems.